Update: The Hollywood’s Brightest Future? Hundreds of local residents plus local politicians and power brokers were in attendance at the Rally to Save the Hollywood Theatre, held on Sunday, November 17. The crowd listened attentively and frequently burst into applause as they heard from a variety of speakers including community organizer Mel Lehan; academic and UBC visiting scholar Angela Piccini; Michelle Barile of the Broadway BIA; VSO conductor Bramwell Tovey; Dan McLeod, editor of the Georgia Straight; actor Mackenzie Gray and others. Following the speakers, there was a long lineup for questions and suggestions from the crowd. Also in attendance were local MLA David Eby, and city councillors Elizabeth Ball, Heather Deal and George Affleck. 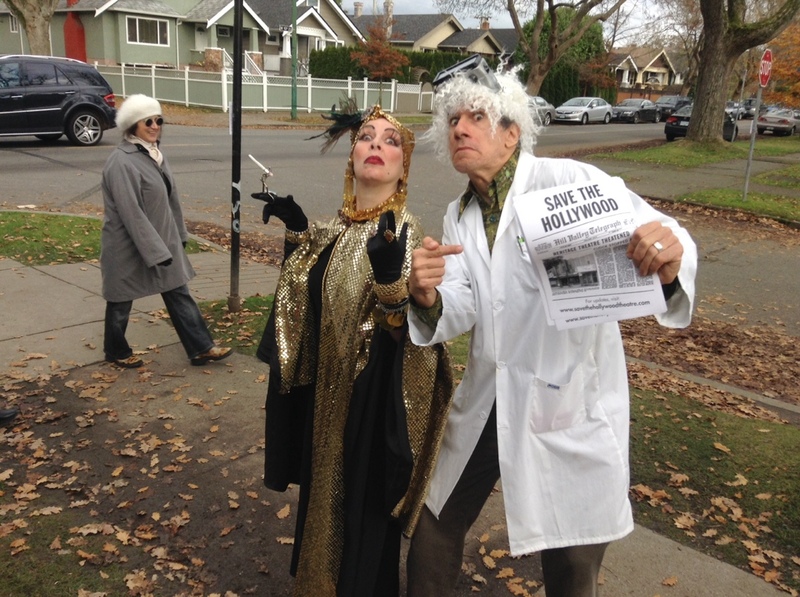 Supporters Adam Abrams and Naomi Singer showed up dressed as classic movie characters Doc Brown (from Back to the Future) and Norma Desmond (from Sunset Boulevard), to the delight of the arriving crowd! They also attracted the attention of the media. Coverage was plentiful! There were reports today from the Vancouver Sun and Province; News 1130, CBC Radio, Global and CityTV. We got hundreds more signatures on the new petition. If you haven’t already signed it online, you can do so here. Sign the NEW petition – a critical next step for victory!